With the stunning Rong River, Xun River and Miao River winding their way through its mountainous expanse, the name Sanjiang or “Three Rivers” is particularly befitting to this county. Located in the north of Guangxi, Sanjiang refers to both the county and county-level city, which lie on the border between Guizhou to the northwest and Hunan to the northeast. The city acts as a central hub between these three regions and is constantly alive with the hustle and bustle of travellers making their way across southern China. 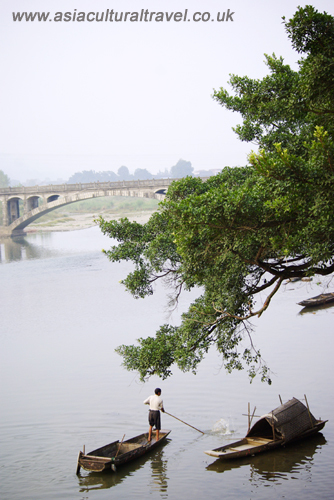 It is the capital of the Sanjiang Dong Autonomous County and thus over half of its population is made up of ethnically Dong people. The city was established in 1105 during the Qing Dynasty (1644-1912) and is itself relatively unremarkable, as it is made up primarily of concrete high-rises and modern shopping districts. However, this modernity is punctuated by several Dong-style buildings, including the city’s very own drum tower. Though most of these structures were built relatively recently and were artificially aged, they are none-the-less beautiful and provide a stark contrast to the contemporary new builds. In most places, it’s “out with the old, in with the new”, but in Sanjiang it seems to be “out with the new, in with the old-looking”! In the western part of the city, locals still hold vibrant markets where traders offer anything from fresh vegetables and handmade clothing to live chickens and discount microwaves! These markets are an organised chaos of food stalls, clothes merchants, haberdashers, fortune tellers, and the occasional street dentist. So if you need your tooth pulling out and have a loose heel on your shoe, but don’t have time to go to two places, the Sanjiang market is the place for you! Sanjiang County encompasses several Dong villages and plays host to over 60 ancient theatrical stages, 120 wind-rain bridges, 200 drum towers, and 500 historical sites. 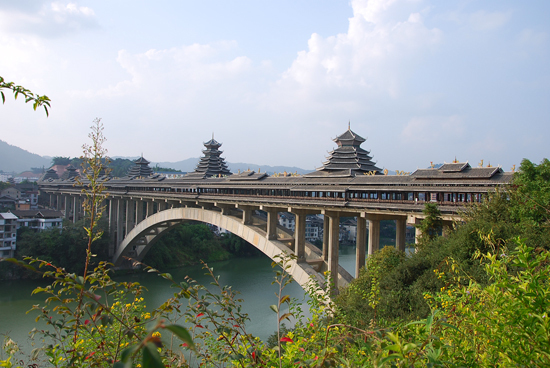 The magnificent Wind-Rain Bridge in Chengyang, just 18 kilometres from Sanjiang City, is considered the most well-preserved of its kind, while the Mapang Drum Tower in Mapang Village, about 28 kilometres from the city, is a true masterpiece of Dong architecture that dates back to the Qing Dynasty. Yet perhaps one of Sanjiang’s greatest claims to fame is its newly built Bird’s Nest, which was designed to ape the strange beauty of its Beijing counterpart. This architectural monolith was completed in 2010 and can be found in Guyi Town, just outside of Sanjiang City. Towering in at 27 metres (89 ft.) in height, with a diameter of 80 metres (262 ft.), this colossal stadium was built by local Dong people in their own architectural style and, like their drum towers and wind-rain bridges, was miraculously constructed without the use of nails or rivets. Dove-tailed joints are all that keep this arena together and each of its corners is bedecked with a beautiful carving of a bird; a symbol of luck in Dong culture. Though this building may appear ancient, it seamlessly combines contemporary and traditional features in its performances. Numerous singing and dancing performances take place within its walls and are accompanied by modern lighting and sound. On the third floor, there are 66 exhibition rooms with displays about Dong folklore, customs, festive outfits, and works of art. One painting in particular, which was made by 20 local farmers and took two months to accomplish, is over 125 metres (410 ft.) long and is considered the largest of its kind in the world. After all, when it comes to art, sometimes size does matter!